The UK Government has signed an arrangement with the Cyprus Government giving residents increased flexibility to develop private property within the British Sovereign Bases. 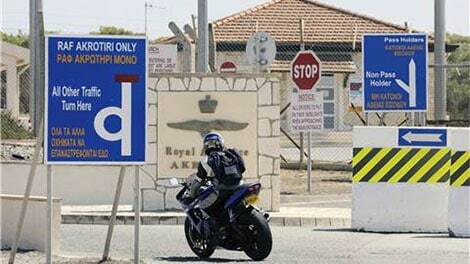 RESTRICTIONS are to be lifted on the development of locally owned property within British military bases on Cyprus, the island’s president said during a visit to London. Nicos Anastasiades announced that a deal had been struck with the UK as he sat down for talks with Prime Minister David Cameron at 10 Downing Street. “Our warm thanks and my appreciation for the historical agreement which has been signed today referring to the development of private property in the British bases,” he said. Until now Cypriots were unable to make changes to homes within the boundaries of the UK Sovereign Base Areas at Akrotiri and Dhekelia, which count as British territory. Mr Anastasiades also welcomed what he said had been Britain’s “prompt and decisive” actions in helping the country deal with its financial crisis last year. Mr Cameron said that his efforts to secure reforms to the European Union would be on the agenda for the talks – as well as “the prospects for peace and reconciliation in Cyprus”. The base areas, retained under UK jurisdiction when Cyprus was granted independence in 1960 as military not ”colonial” territories, are home to around 10,000 Cypriots. Under the terms of the deal, they will now enjoy the same planning regime as other residents of the Republic of Cyprus – though with “appropriate safeguards” of UK military needs. Around 60% of the 98 square miles covered by the base areas – 3% of the east Mediterranean island’s total land area – is privately owned. The agreement was announced by Anastasiades on Tuesday during a working dinner with the Secretariat of the National Federation of Cypriots in the UK and was signed between Foreign Minister Ioannis Kasoulides and Foreign Secretary William Hague at Carlton House. The arrangement between the government of Cyprus and the government of the United Kingdom relating to the regulation of development in the Sovereign Base Areas. @Alex. All that you say is valid. However, I think what Peter Davis was getting at was not materialism, living standard, literacy, education etc etc but attitude and behaviour. The Cyprus Property Scandal is a poignant example of a society whose successive governments, banks, developers and lawyers have collectively conspired to create and foster this scandal. A country having a truly first-world attitude and moral compass would have stamped it out years ago. There are, as yet, not enough individuals here prepared to think and act in a first-world way to force change but I believe that the necessary critical mass is approaching. Polis Polyviou threw down the gauntlet in his Mari Report, President Anastasiades appears to be doing some of the right things and the Governance Charter for a New Cyprus movement is definitely first-world. Fingers crossed. Much of what you’ve just stated is true, but I’m afraid misses the point slightly. Have you read this: If Cyprus falls into Putin’s grip, the West will have lost the first battle in the new Cold War. Middle Eastern terrorists are a threat, but the MAIN thing we’re REALLY worried about is these chaps getting their hands on, or developing the technology to acquire, the now infamous WoMD. The most likely place they can get that short term is, you guessed it, Russia. Our interest in Cyprus is ALL about keeping the Russians at bay and Cyprus knows it and will play on it. The mostly British expat purchaser of Cyprus property is an unfortunate but nevertheless expendable casualty in this much greater game. We can expect to receive no justice here. @SoOJB and Peter Davis. Entertaining as it is, I refrain from joining your fray lest it just goes on and on. However, I happen to know that a big article on the subject of ‘the Man versus the State’ and the state of the Cyprus judiciary and how much justice ‘as we know it’ is possible here is (I am told) coming up in the Cyprus Sunday Mail on 2nd Feb. I didn’t pen it. The author presents a compelling personal case history. I know I said “end of…but” Wow. Bases in Cyprus? Stop and think, if you make a statement often enough it becomes the truth. People keep spouting we need ‘them’ they keep us safe? Really? Just how do they protect the UK? The last terrorist killing of a British soldier took place outside Woolwich Barracks. London (Brixton) is the Headquarters for the PLO and many other extremist organisations. Hate Preachers on the street corners. Working in London I’ve stopped to listen to them. And the Muslim Brotherhood (banished from Egypt as a prescribed organisation) has now set up office in Cricklewood, London. The Brotherhood leader stating the. “British are very tolerant to this sort of thing”. How did our Cyprus bases stop the London suicide bombings in July 2005. The fifth member of that group (the only one alive) is due to be released from prison next week and has vowed a Mumbai-style attack. He was caught trying to buy weapons. Cyprus and Egypt probably need bases in London to keep them safe? The UK is now ‘Closely’ watched by the US. Do we need feet on the ground in Cyprus? Have we no spy satellites when even NCIS have them? For a fraction of Â£2.5bn a year (the .5 billion) I can report back to London on ships using the harbour, after all I’m not likely to miss a 600 ton freighter and I live under the flight path of the airport. And yes I am sure the Russian loan didn’t come without conditions (with Syria closing its ports). You ask if Cyprus is a thrid world country? It actually received Funding from the Arab Kuwait Fund for developing countries, which paid in part for the flyovers on the Paphos-Nicosia motorway. Is the country poor and in need of financial help? Well it takes the money. As for your question regarding the courts. I didn’t mention that I also attended a civil case between one of the largest developers on the Island and an individual in Paphos Civil Court. I was impressed with the Judge. His common sense approach and he in fact brokered a settlement between the two parties without expensive litigation. Not his job but he was ‘pro-active’. My experience with the Criminal Court was the exact opposite. A Court Prosecutor and a Judge who were sharing jokes, with the judge re-wording the questions for the prosecution. Missing evidence (just days before another expert witness flew out from the UK to examine it) a court refusing to call witnesses required by the defence and the police failing to supply all the statements. Very bizarre. But just maybe in a civil court there is justice for those who are left without title deeds. I would like to think so. Also remember ‘We are not alone’ some of the Cypriots are also caught in this mess. And remember we are all foreigners abroad…definitely my last word. â€œCrass: showing no intelligence or sensitivityâ€. So, the statement that you donâ€™t get whatâ€™s going on in the TD scam is unintelligent and insensitive? The second bit, maybe (so sue me! ), the first bit, letâ€™s have a looksie, shall we? You talked about UK army basis in Spain and Africa and somehow compare that to Cyprus? You talk about how much of an expert you are in law and financial matters, but, with experience in the Cyprus courts, how much â€œjusticeâ€ have you seen being meted out to British property purchasers? Câ€™mon, donâ€™t be shy, tell us! Are we treated fairly, in your considered opinion? You talk about the banks being negligent(â€œNegligence: failing to take proper care over somethingâ€), but again, in your vast experience, how many instances have you seen in any other country of lenders: lending against a piece of land thatâ€™s going to be developed, then lending against the estimated value of the development once itâ€™s nearing completion, then lending again once itâ€™s been sold (using the very Contract of Sale document to say what the sale price is thus what the new value is, perfectly legally of course as the TD scandal means that the sold property is still in the name of the developer so can be used as collateral), then lending AGAIN after they havenâ€™t collected a red cent in interest FOR YEARS, in order to restructure the loan in order to hide the non-payment of interest. Oh, in the meantime unilaterally changing the definition of an NPL so that lending against the same bit of land FOUR TIMES can hide from auditors. Plus getting their surveyor mates to ridiculously inflate the value of the property anyway! Even you have got to admit that the multiple lending can ONLY occur if sold property is still considered as part of the sellerâ€™s assets. So, without the TD scandal, these overblown loans could not have happened. So, it comes down to, why are the Cypriots allowed to get away with it? Shouldnâ€™t there be some big stick from somewhere (the British government, the EU, the IMF) willing to sort these foreign devils out (â€œused to be British but gone to the dogs nowâ€. OK, you didnâ€™t actually say that bit about Cyprus, you did intimate it about Tanganyika though and said that Cyprus is a bit worse). The answer, my friend, is this: The place is a strategic jewel. Cyprus has been flouting EU regulations since day 1 and will continue to do so. The British government, for many reasons that you say you just donâ€™t get (Jan 16, 8.13 am), retains a military presence in Cyprus but WONâ€™T intervene, the EU, for its own reasons, takes the line: â€œWe give you money, we issue an MOU, we threaten not to give you more money, you donâ€™t comply, we change the conditions and say you have. We ignore anything elseâ€. You must have seen these? Russian Air Force may get use of Cyprus base – Minister, World View: Russia Seeks Military Air and Naval Bases in Cyprus, Russia eyeing Cyprus bases. I wonâ€™t bore you with details of other stuff that us cognoscenti are privy to, but the leadership of Cyprus do like their high-stakes poker, so have been willing to go out on a limb to basically, ahem, acquire loads of money from the EU and not even attempt to rectify, pursue the guilty or feel in the slightest bit sorry. PURELY BECAUSE THE MILITARY JEWEL IS TOO PRECIOUS FOR THE AMERICANS AND US TO RISK (hence all the flirting with Russia, just to remind us). So, the funny â€œless than third worldâ€ foreigners (your â€œsensitiveâ€ words, not mine) pulled a fast one on us. If you think its negligence and not a scam, then I can think of a more appropriate use of the word â€œcrassâ€. @Richard. You have missed my point. You just don’t give an inkling as to what you reckon ARE the practical propositions to get rid of the scheissers or shysters as you call them! Hence my tongue-in-cheek guess that you might just be suggesting assassination. Come on, give us a clue! To comply the title deeds need to be issued. The Government can simply set up a department holding title deeds and issue them to that office. Job done. Or issue them to the bank or developer holding the mortgage. There was no stipulation, as I understand to issue them to the residents or persons who have paid in full for their villa. @SoOJB. My next issue is…..the title deeds having to be issued by the end of 2014. This will never happen so I assume we keep on going round with the Germans raking it in and the banks not calling in their debts, ‘purchasers’ still without title deeds and the virtually non-existent Cyprus property market actually becoming non-existent. It sounds like we all have many more years of this ‘game’ to go as the Cypriots don’t want to tackle the problem, the Troika are getting their knuckles rapped for not playing fair (there goes any pressure from the MOU re: title deeds)……and the waiting/guessing game continues. Looks like I’ll just sit this one out until retirement at this rate! The laws of property here are based on the Ottoman system not UK Law. I waited nearly 12 years for my title deeds and paid close to twice as much for them, (with my developers fines for late payment) as I should have done had I received them in 2002. The experience of paying at the Land Registry is one I wish to forget as lottery numbers were quoted and then subtracted by 5% if I paid without fuss. Surely I either owed the money or did not? The numbers quoted to start with were no where near my calculations. It took several hours of bargaining to get a realistic figure and even then I overpaid by nearly â‚¬400. In short it is a money making scam for a (morally and financially) bankrupt country. So I don’t understand how you make a crass statement such as I have a. “FUNDAMENTALLY MISUNDERSTANDING what this title deeds thing is all about”. I have both legal and financial qualifications and have taught both in the UK (and even in Cyprus). As for the legal system here I have spent 20 months in the Criminal Court in Paphos as an “expert Witness” five days of which were spent giving evidence. So I understand only too well the legal system here in Cyprus based on UK law and using UK ‘Case Stated’. Again I reiterate if a ‘person’ (or bank) through poor procedures is negligent and then suffers a loss as a result, the court may, and should take that into consideration, as they have failed to mitigate their losses. Try Googling “The Doctrine of Mitigate losses”. But this is Cyprus…end of conversation. If you say the legal system of Cyprus let the homebuyers down and ask if a British administration would have allowed the TD scam (the answer is of course not, by the way), then you are FUNDAMENTALLY MISUNDERSTANDING what this title deeds thing is all about. The legal system, those who â€œshould know betterâ€, have achieved exactly what they set out to. The poor guy who spent his Â£14k life savings paying off the developer in order to get his title deeds (was that you, by the way?) is EXACTLY what they wanted. Plus all the money they borrowed with no intention of ever paying it back, of course. Onto the more serious question of when does this merry-go-round end? There is a popular expression: â€œHe one who pays the piper calls the tuneâ€. Firstly, I think Iâ€™ve sent something like this before: Euro Bailout Fund: Germans Pay Less Than Their Neighbors. Basically, the Germans arenâ€™t paying that much. Secondly, thereâ€™s this one: Profiteering: Crisis Has Saved Germany 40 Billion Euros. So, not only are they not paying much, they are actually raking it in. So, what ARE the Germans going to do next (if the present status quo is quite gemÃ¼tlich really)? I strongly believe they will press home their advantage (dastardly fellows one and all! : Plenty for the new government to do in Europe) and alter the current EU treaties in such a way as they will be the new dominant partners. Iâ€™ve talked before of a new Euromark, but if you can effectively achieve the same thing (with all countries in Europe economically subservient by having to adjust to your business model, whether or not it be in their best interests), then hell, why not? So, he who gives the IMPRESSION heâ€™s paying the piper will continue to do so and the music for the merry-go-round will carry on until someone blinks first (say Cyprus if it gets its gas money in or Greece or maybe even France? Though I doubt it…) and does an Iceland, realising that the pain theyâ€™re inflicting on their citizens (in order to perform economically as Germany wants) is too much and crashes out. Which may never happen. In the meantime, Cyprus bank ransoms will be demanded and, unfortunately as the life savings guy demonstrated, paid. Big difference between occupying a base on someone else’s land and bringing education, law and order to a third world country. For example do you think the British would have allowed the problem of NPL and title deeds to run and run? No. All these people would have been issued with deeds at the point of sale, building on a mass scale would have been controlled along with regulations being enforced. Not of course that Cyprus is a third world country many of those are more advanced, its just our legal system and attitude by those who know better that let us down. @SoOJB. One question regarding your comment ‘Cyprus is one of the HARDEST countries in the world in which to repossess a property’. I assume the banks checked there was title for the land before they lent to the developer otherwise what was the collateral for the loan? Therefore, as most purchasers don’t actually have title deeds the actual two parties involved in this game are the banks and the developers. The developers won’t pay, the banks won’t repossess. The Germans will keep the lending going. Round and round we go but where does it end? I agree with all the points you make (actually, theyâ€™re not points, theyâ€™re just statements of facts). We could also say, â€œThe putting together of historically opposed tribes in the same country whose borders we drew (for our own reasons) was an extension of divide and rule; a country mired in internal strife cannot effectively manage its resources (as it has much bigger issues to divert attention such as corruption leading to poverty, starvation, brain drain etc) so makes it significantly easier to deal with (i.e. Nigeria). Or we can create an artificial country where all the resources are centred so as to deprive the wealth from it to the vast majority of the regionâ€™s population (Kuwait, for example). However, none of this I am actually saying. Your earlier post (Jan 16, 9.16 pm) seems to take the opposite view to the one youâ€™re expressing now, giving the impression that we shouldnâ€™t be meddling in other countriesâ€™ affairs as the blowback does us no favours. Iâ€™m not even agreeing with this one either. We can judge the rights and the wrongs of empire in another forum at another time, if you wish. What I AM saying though is that the blowback from the British handling of Cyprus, for right or wrong, is VERY present in the current situation. We are dealing with a very clever bunch of Cypriot chaps who are playing the â€œStrategic Importanceâ€ game to the very limit. If we realise what works and what doesnâ€™t, in this very particular situation, weâ€™ll know what action to take to best arrive at the least worse outcome. Which brings me on to Jannerâ€™s question. Nigel is completely correct. Nobody wants a bunch of un-saleable property, mostly built really badly, on their books. The two repossessions I was involved in (the Lending Manager called me in as the defaulters had investment portfolios and she didnâ€™t understand them) cost the bank SO MUCH MONEY to repossess that, unless thereâ€™s a fat margin in there, it simply isnâ€™t worth it. Cyprus is one of the HARDEST countries in the world in which to repossess a property. So threats from the bank are ransom demands (not for the Cyprus properties, but for real money, a lot of which may be found in your UK property). Many people will pay this ransom for fear of losing their Cyprus property. Will the EU lend money to keep Cyprus banks afloat? Only just enough. The EU and Germany have their own DIFFERENT reasons for keeping Cyprus banks from defaulting, (one to save the Euro, the other cos it makes a load of money in keeping things JUST HOW THEY ARE). Unfortunately, those responsible for this whole scheme know all the above and have constructed the scam in a way to maximise returns. Oh, and to escape any possible criminal prosecution. @Nigel Howarth. I appreciate that the banks don’t want the property as it’s worthless at present. But is the land they are sat on worthless? There is nothing to stop them taking the lot back when it suits them. It just leaves so many in status quo. If they were going to tackle the TD issue they would have by now. So where does that leave everyone? The TD problem is in the too difficult box for now. When all the valuable and probably titled assets are gone they are surely still left with thousands of properties and land still on their collateral books. Then, they will come for us! I can only give an example. Born and raised in Tanganyika the British built roads, rails and infrastructure and fed the people. They united tribes because they would not allow the infighting. Schools were built and skills were taught in farming and management. I would love to return but the area is no longer safe to live in. Just look at all the wars now in Africa, so rich in animals, fertile land and minerals where for example in the “Breadbasket of Africa” (former Rhodesia) the life expectancy is 24 years and starvation is the biggest killer. So tell me how has ‘freedom’ has helped the population? To come back to your points – assassination is a very silly idea for two reasons. Firstly – it’s illegal. Second – in any corrupt hierarchy (e.g. the mafia) what happens when you kill a ‘don’? You just get a senior captain take their place. Result? The status quo is maintained. I don’t have ‘grand wishes’ Denton – just intent. It depresses me when people make statements like this. It suggests that ordinary people are so down-trodden, so unwilling to accept the possibility of improvement that it plays to the hand of the shyster minority even more. Why should the shyster minority fear when people will moan incessantly yet do nothing except squabble amongst each other? You aren’t alone – most people are sheep at the end of the day. What we need now are more people prepared to accept that there are better ways – new ways – workable ways of overcoming this (and many other) difficulties. As soon as those ways are manifest by even a small minority – the majority herd will follow. At that stage – maybe the shysters will be sidelined as irrelevant. As we all know – being irrelevant is the most debilitating manoeuvre of them all! @Janner – The bank doesn’t want the collateral – what’s it going to do with it? No-one’s buying at the moment and it would be a millstone around its neck. They could seize the profitable parts of a business, such as hotels, etc. At least it would get get some money. More likely banks will put an administrator into the company to run the business and use some of the income the business generates to repay the debts. If you failed to repay your mortgage in the UK, the bank could seize your property – but there’s a ready market in the UK and they’d soon find someone to buy it. If Cyprus is so broke why haven’t they called in the assets used as collateral. I’m sure my bank in the UK would have acted quickly. Has Cyprus really been allowed to borrow more money to pay non-performing loans and not call in the debt. I’m no banker but that sounds unsustainable. Free money? I think not. What are they waiting for exactly? I don’t think its because they care whether people are made homeless! I’m sure SoOJB can enlighten us! @Richard. Get rid of a sizeable proportion of all the scheissers? But HOW exactly? Assassination? I, and I suspect many others, would welcome some practical suggestions rather than grand wishes. @Stuart / @SOOJB et al.. The ‘same page’ (for me) is ordinary folks who need to get together to solve a problem. The UK and Cyprus (like anywhere in the world) are full of ordinary people who need to live their lives and balance contribution against consumption. Some are stellar at that balance (one of them recently sadly passed away) – most are average – and a few are rotten stinkers. The problem we have is ordinary folks cannot mediate a solution between themselves. If we could – we’d have eyeballed each other years ago and done it. I don’t think everyone in Cyprus is evil and needs to be hit with a heavy stick – that’s ridiculous. Some of the biggest darned crooks in this property caper were (are) Brits! Tomorrow they may be – who knows? Too many vested interests here from certain political, fiscal and “professional” (and God – I really do use that term in the very LOOSEST sense) quarters. Read Roman history for inspiration! That’s the problem – get rid of a quite sizeable number of all those shysters and put more empowerment back into the hands of ordinary people. If you did that – it wouldn’t be just Cyprus property problems resolved but a list long enough to crash CPN’s server (and some)..
@Richard. While I don’t disagree with your views that Britain should take a more robust attitude to the matter of the reprehensible Cyprus property scams, I can only quote what the government has stated in a written reply to the House of Lords. You are no doubt aware of the fact that EU membership is currently a very vexed question in Britain and is being seriously challenged by the United Kingdom Independence Party which is driving the agenda with some notable success. It will be interesting to see what happens to the resolve of those who are charged with defending the interests of British citizens once the European elections have taken place in May this year. I’m in the process of reading a book entitled “All the countries we’ve ever invaded”. There are 193 UN registered countries in the world; guess how many Britain has invaded? 171! I used to think we were the GOOD guys! @SOOJB – and your final point about “reading the small print”. There wasn’t actually any small print to read – that was the (dastardly) clever bit. @SOOJB – Actually, I’m beginning to blame the Cypriots less than the west over the last half century. It was actually Henry Kissinger who ‘turned a blind eye’ to the Turkish invasion of Cyprus. The second (critical) landing in 1974 could have easily been stopped had ‘allied’ forces not decided that Turkey was too valuable a strategic military partner to not hack off. Former UK PM James Callaghan in the EEC under the cloak of the Geneva convention at precisely the same time that breaches of the same convention were responsible for slaughtering thousands. Cyprus was effectively sacrificed by the US under the lame excuse that “Watergate had our attention”. A domestic affair eclipsing important world affairs – surely not? Politics burns ordinary people. Wind the clock forward 40 years – has anything changed? Obviously not – unless of course – we decide the days of ‘collateral damage’ have outworn their welcomeâ€¦. NOW the debate is moving onto the serious ground! Peter, can I answer your questions? 3) Does NATO want the bases? Not really. Does America want them? Abso-bloominâ€™-lutely! Here, have a butcherâ€™s at this: Cyprus Military Intelligence | the importance of the Sovereign Base Areas. 5) Maybe the Title Deed Fiasco is a bit of payback? Again, you got that in one! So, this is where we are. Our ONLY hope is that the good folks of Cyprus who devised this whole scheme over-play their poker hand and we (or rather the Americans) feel that the SBAs are in jeopardy. @Stuart: “It will, however, take a close interest in the measures by which the Cyprus government attempts to resolve this problem. So the reality of the situation is effectively to say that the UK is very sorry but it is not going to intervene in resolving an issue for which the Cypriot authorities are entirely responsible”. Stuart – a lot of the brokers duping UK citizens out of their life savings with this unregulated scam were BRITISH! Cyprus as an E.U member state has responsibilities that go alongside the benefits of E.U membership – yet has appeared consistently over years to shirk them. The UK surely has leverage in the E.U as a similar member state? It seems to me the UK is being weak and limp in defending the citizens of it’s own country in the face of indefensible and morally reprehensible actions and I’m at a total loss to explain why this should be? What is the value these days of having a British passport and British citizenship? My Grandfather who fought for the liberty of British people in WW2 would turn in his grave.. Seriously a fight against whom? Why is Britain playing policeman. Were the Cypriots asked for a vote on this issue? The bases cost over Â£2.5b a year to run. Maybe if NATO wants these bases so badly NATO could pay for them as the UK is broke? We appear to manage very well without bases in Spain and several African countries. No wonder the locals here resent the average Brit. Maybe the title deed fiasco is a bit of payback? We do ourselves no favors at times. Question: If, in the future, people buy or build a property within the Sovereign Base Areas, are they buying/building property in Cyprus or in Great Britain? @DaveC and @CCP – I believe most people are aware of the strategic importance of the SBAs to the security of the UK (and other countries). Luckily for us, Nato and others don’t share your views. The strategic importance of Cyprus has historically been secondary to Malta. However, the Russians are looking to expand their influence in the Mediterranean, but up until now the only country that has given their navy harbour facilities is Syria, which is probably the reason the Russians have supported Assad in the Syrian uprising. In fact, the determination of Assad to make no concessions probably comes from the confidence engendered by Russian support. Ex President Christofias was asked to give the Russian navy permanent harbour and dock facilities in exchange for a bale out. That cannot happen while British forces are present. My hope is that the bases land development agreement does move Cyprus closer to Britain and as a consequence the Cyprus government gives more thought to the concerns of British ex-pats living and holidaying on the island. However, the major influence on Cyprus is still the EU, but we can see, sadly, that missing title deeds are not on their priority list. Under the terms of the deal, they will now enjoy the same planning regime as other residents of the Republic of Cyprus. Does this mean they will be able to build and alter properties without restriction from planning laws. They will be able to build houses on land that isn’t suitable for building. The free for all has returned. Cypriot families that own land in military territory will be able to sell to the greedy developers. The bases are of a very strategic nature. For obvious reasons I donâ€™t want to go into the detail. However, without them we would not be able to continue our fight on terror, effectively. @Suzanna. Your sentiments are undoubtedly echoed by all who have yet to receive their Title Deeds but in a recent written answer to the UK House of Lords, the UK government stated that although Britain is keeping watch on the Cyprus Title Deeds fiasco, it cannot become involved with individual cases. It will, however, take a close interest in the measures by which the Cyprus government attempts to resolve this problem. So the reality of the situation is effectively to say that the UK is very sorry but it is not going to intervene in resolving an issue for which the Cypriot authorities are entirely responsible. Why have we still got these bases? Why is the British taxpayer still encumbered with the financial cost? Please close them and return all the land to Cyprus and the troops to Britain. I would hope that the British Government did not just roll over without receiving assurances that British subjectâ€™s interests in Cyprus would be part of this â€œdealâ€. This was an ideal opportunity for our government to press for greater protection for families who through no fault of their own may see their life go down the drain due to the unscrupulous behaviour of the island’s developers, bankers and lawyers. Title Deeds are obviously not important enough to discuss – surely David Cameron is aware of these issues and could have asked that this be given priority in exchange for the land Development agreement? I’d loved to have been a fly on the wall in 10 Downing Street! I bet Cameron gave his Cypriot counterpart a real mouthful with the way his countrymen have treated UK citizens. I can imagine how he said to him “that he wants justice for every British buyer” and Cameron told him straight how corrupt the the property system has been for years! Then again, he probably didn’t. No different to every single MP and MEP. Empty words and left to each individual to go through the corrupt Cypriot legal system and fend for themselves. Banks to take hit on Swiss Franc loans?